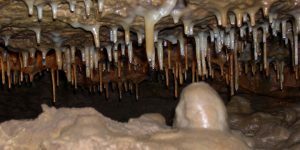 Accidents in caves may result in a variety of medical problems that initially are little different underground than they would be aboveground. However, underground they normally are more difficult to treat; arrival at a medical facility often will be delayed, and rescue operations, if needed, will cause increased stress for the patient. 3.1 Avoid Becoming Wet Whenever Possible. Medical problems may include bleeding, sprains, fractures, head and spinal injuries, chest injuries, unconsciousness, hypothermia and others. Therefore, all cavers should be familiar with both the theory and practice of first-aid procedures, including artificial respiration and cardiopulmonary resuscitation; should be capable of making level-headed, intelligent decisions regarding the most satisfactory and feasible methods of handling a medical emergency in any caving situation; and should be efficient in implementing such decisions. 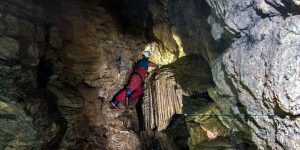 It is beyond the scope of this article to cover all first-aid and medical measures that might conceivably be needed in a caving situation. 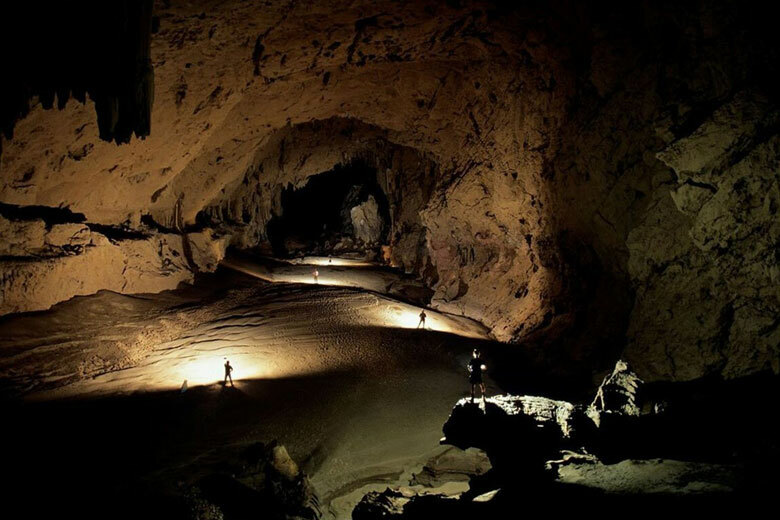 Therefore, we will be discussing primarily those closely related to caves and the caving environment, or those that have special implications in a cave situation. 1. It is important to establish air exchange as rapidly as possible. Irreversible damage occurs within four to six minutes after the brain cells are deprived of their oxygen supply. 2. With the victim on his back, place your face close to his. Look, listen, and feel for air exchange. 3. If no air exchange is apparent, immediately roll the head on its side; using your finger, quickly sweep the patient’s mouth clear of foreign objects or material. 4. Roll the head back to its original face-up position. 6. Hold the nostrils closed by pinching them with your thumb and finger. Seal your mouth on the victim’s mouth and blow a breath into the victim’s lungs, watching to see that the victim’s chest rises – a confirmation that air exchange is taking place. 7. Place your head close to the victim’s to determine whether you can hear air escaping from the victim’s nose and mouth. 8. If no exchange is taking place, you may need to accentuate the stretch of the neck to get the tongue out of the way. In order to pull the tongue as far forward as possible, insert your thumb between the Patient’s teeth and, with your fingers under his chin, Pull the jaw forward. a. Maintain maximum extension of head as just described. b. Pinch patient’s nose shut with your thumb and forefinger. c. Take a deep breath, open your mouth wide, and place it over the mouth of the patient, making a tight seal. e. Remove your mouth to allow patient to exhale. f. The process of blowing into the mouth, followed by exhalation of air from the patient’s lungs, should be repeated twelve to fifteen times a minute for an adult. h. Mouth-to-mouth resuscitation should be continued until the victim revives or until trained personnel are available to assume care of the patient. 10. Once initiated, mouth-to-mouth resuscitation should not be terminated prematurely, for patients have been known to revive after hours of mouth-to-mouth resuscitation. Shock is the disruption of the blood circulation, which in turn can upset many vital body functions; these are depressed due to the loss of blood volume, reduced rate of blood flow, or lack of oxygen. Shock can be caused as a result of severe injuries; it may also occur with injuries that in themselves would not ordinarily be fatal, but in conjunction with shock may well prove to be so. When in shock the body constricts many of its blood vessels, causing shunting of the blood to vital organs. Symptoms of shock include pale, bluish, cold skin, which may be moist and clammy; weakness; rapid, often faint pulse; increased rate of breathing; and in advanced stages, apathy, dilated pupils, and mottled skin. First-aid measures should seek to improve the victim’s blood circulation and supply of oxygen and to maintain the body’s normal temperature level. Keep the victim lying down-the position dependent upon injuries he may have incurred-keep him warm, and seek help immediately. First-aid treatment of shock, as is true with other medical emergencies, is something that should be known by cavers before the situation arises, and a comprehensive outline of the treatment of shock is beyond the scope of this website. It is specifically mentioned here, however, because it is an extremely serious condition, which is worsened by hypothermia, and this relationship should be noted. Hypothermia is a state of low body temperature. It is sometimes referred to by cavers and others simply as exposure. Hypothermia can be and has been a killer in caves. We have noted earlier the wind chill factor, the intensification of loss of body heat when the body is wet, and the need for proper clothing, including a wet or dry suit in some situations. However, accidents can occur, cave conditions may be unanticipated, or other emergencies may develop that cause temperature stress for a caver. Therefore every caver should understand what occurs, recognize the symptoms, be prepared to aid victims of hypothermia, and be knowledgeable regarding its prevention. The human body is homoeothermic – that is, its inner body temperature is maintained at a constant level. Although the body extremities may often be many degrees below normal body temperature when exposed to cold, it is vital that the inner body core temperature be maintained, for major deviations from this level – either upward or downward-prove fatal. 1. Radiation, in which heat is radiated from the body to its surroundings, or, conversely, heat is radiated from the surroundings to the body. 2.. Conduction, in which heat is lost or gained by contact with other objects, such as water when the caver is immersed. a. Evaporation of moisture on the body (from sweating or due to the presence of wet clothing), which can cause the body to lose great amounts of heat. b. Respiration if there is heat loss or gain due to the differential between body and air temperatures. Hypothermia occurs when the body loses heat to its surroundings faster than it can replace it. With reduction of the body’s core temperature to approximately 96°F the victim begins intense shivering, which is a means of heat generation. This in itself is a possible hazard to the caver, because it causes coordination to be severely reduced and the possibility of a fall is greatly increased. At this point the body has already reduced blood flow to the extremities, and vascular constriction, which aids the body in keeping warm blood in the body core around the vital organs, has occurred. When the temperature drops to between 95 °F and 91°F, the caver will display reduced ability to think, difficulty in speaking, poor coordination, and often disorientation. He will continue to shiver, but his heat production will be inhibited, and his central nervous system will begin to fail. With a drop to between 90°F and 86°F, muscular rigidity occurs with erratic movement, and amnesia may occur. The victim may become unconscious at approximately 86°F or 87 °E and/ or display a glassy stare, slow pulse, and slow respiration. Death will ordinarily occur when the core temperature reaches the range between 85°F and 77°F. Few victims survive if their core temperature drops below 80°F. At the first sign of hypothermia in a caver, every effort should be made to warm and aid the victim quickly. If possible, remove him from the cave immediately. If the victim is wet, immediately give him dry clothing in whatever quantity available. The victim should be protected from air movement, and if stationary in the cave should be elevated above the cold cave floor by means of packs, clothing, rope, or other articles. Heat from carbide lamps or a backpack stove under a protective insulating cover, such as a space blanket or plastic sheet, should be provided. Hot foods and drinks are excellent if the victim is able to take them. Direct body contact with another individual, as in a pre-warmed sleeping bag or similar arrangement, will be advantageous in providing heat. It is important that those aiding the victim realize that sources of heat must be supplied to the victim. Merely placing him in a sleeping bag or similar methods will not suffice, for once his body undergoes decreased ability to produce heat-and this occurs fairly early in hypothermia – he cannot raise his body temperature by himself, even with the aid of insulating material about him. In advanced hypothermia, resuscitative techniques may be necessary. Do not give up such efforts prematurely that “if the patient arrests profound hypothermia, the time of biological death may be extended up to 10 minutes due to the slower metabolic rate. Several precautions should be employed in order to prevent the possibility of hypothermia. One of these is sufficient amounts of the proper type of clothing, including a wet or dry suit if necessary. Remember also that wool is recommended, since it is much more efficient in conserving body heat, even when wet, than cotton or Other materials. A disproportionate amount of body heat is lost from the head and neck as compared to the rest of the body. Make special efforts to cover and protect these areas in cold temperatures or cold water. Good physical condition is very important. The fit caver does not become fatigued as rapidly as the caver who is less fit. Fatigue can be dangerous because it reduces the body’s ability to produce heat through physical exercise and shivering. Also, the fit caver is far better able to negotiate his way out of a cave when under duress or faced with the potential onset of hypothermia. Avoid Becoming Wet Whenever Possible. If intervals of inactivity in cold temperatures become necessary; periodic periods of exercise, such as running in place, may be valuable as a means of increasing the body’s heat production, but do not do this to the point of fatigue, which will intensify the effects of hypothermia, should you contract it. Gauge your energy levels and those of your companions and do not allow any of the party to become dangerously fatigued. Body types vary in their susceptibility to heat loss. For example, all other factors remaining equal, a thin caver may be expected to lose body heat more readily than a caver with an insulating layer of subcutaneous fat. Caving requires energy, as does heat production by the body. Fuel the machine by eating a nutritious meal before entering the cave, and eat high-energy, quick-energy foods, such as carbohydrates, while caving. If possible, arrange for hot food and/ or drinks while in the cave. Hyperthermia is greatly increased body temperature. It is less frequently seen in temperate climate caves than is hypothermia, although it may occasionally occur, and certainly cavers in warm areas of the world, including the southern and desert areas of the United States, should beware of the possibility of hyperthermia. 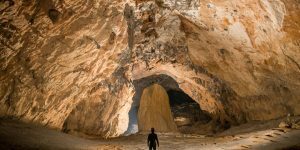 Causes of hyperthermia in cavers may include high cave temperatures, but in temperate caves are more often tied to metabolic heat production and clothing. Thus a caver wearing a heavy coat or layers of wool clothing who felt quite comfortable while visiting the bottom of the cave or while waiting there for his turn to ascend the recipe out of the cave may seriously overheat while undertaking the ascent. During this strenuous activity his body is called upon to exert a great deal of energy, thereby increasing his heat production ten to fifteen times over that while resting or inactive. 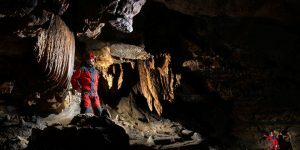 With excessive clothing blocking loss of excess body heat to the atmosphere, the caver’s body temperature increases. This is a primary reason cavers are advised to wear layers of clothing, allowing removal of the desired number of layers, and/or clothing that allows venting as a means of controlling the dissipation of body heat. Under heat stress, the body’s heat gain must be reduced before it reaches a certain level, or fever ensues, which can lead to death if it is not controlled. The primary means whereby the body relieves itself of excess heat is through evaporative cooling of the skin and un.derlying areas by evaporation of sweat from the skin. The inner core of the body is cooled when its heat is transferred to the blood, which is then directed to the cooler peripheral body areas adjacent to the skin. Ordinarily evaporative cooling is efficient. Evaporation may be retarded, however, by high humidity or by heavy clothing, as in the example above, and hyperthermia may result. Evaporative cooling is also expensive in terms of water use; large amounts of it are expended in critical situations. Thus it is important that cavers in situations that may contribute to hyperthermia drink sufficient amounts of water. As blood is shunted away from the viscera to peripheral body areas for cooling, cardiac activity is increased. If the cooling mechanisms are insufficient, the body temperature begins to rise. Dehydration of the body due to profuse sweating often occurs in this situation. When this happens the blood becomes increasingly concentrated, blood flow becomes inadequate, and the core temperature continues to escalate. Three general types of heat-related illnesses can be p’ pointed. The first is known as heat cramps. These may affect individuals engaged in strenuous activities in for environments. Loss of large quantities of sweat creates an imbalance in the electrolyte ratio. If salt intake is insufficient to remedy this imbalance, heat cramps may occur. Sufficient ingestion of salt when heavy work is to be carried out in heat is an important preventive measure. Symptoms include muscle cramps and pain in extremities and abdomen, faintness, and profuse perspiration. First-aid measures include removing the patient to a cool place, giving him salted drinking water (one teaspoon of salt per glass, half a glass every fifteen minutes for an hour), and massaging of the cramps. The second type of illness is heat exhaustion, which may also occur in individuals undertaking Strenuous activities in hot environments. With quantities of blood directed away from the body core to the body surface, pooling of blood in the peripheral vessels combined with the pooling in the lower extremities when a person is standing sometimes provides an insufficient blood return to the heart and brain, thus leading to physical collapse. Symptoms include weak pulse, rapid and shallow breathing, generalized weakness, pale and clammy skin, profuse perspiration, dizziness, and sometimes unconsciousness. First-aid measures include removing the patient to a cool place, keeping him in a prone position with his feet elevated 8 to 12 inches, giving him water with salt, removing as much of his clothing as possible, and removing body heat by convection. Evacuate the caver as soon as feasible and seek medical help. Heat stroke, the third and most serious type of illness, should be recognized as a true emergency; if prompt action is not taken, the patient may die. Heat stroke is a catastrophic disturbance of the heat-regulating mechanism of the brain. It is associated with high fever and collapse, and may result in convulsions and unconsciousness. Symptoms of heat stroke are very different from the two conditions described above, for in heat stroke the sweating mechanism no longer functions and the skin is hot and dry. Symptoms include sudden onset of the condition: hot, flushed, dry skin; dilated pupils; full and fast pulse; breathing that is fast at first, then changes to shallow and faint; early loss of consciousness; muscle twitching, possibly leading to convulsions; and a body temperature elevated to between 105″F and 106″F or higher. First-aid measures include removing the patient to a cool place; removing as much clothing as possible; assuring an open airway; attempting to reduce body temperature immediately by dousing body with water; wrapping victim in wet clothing, and, if convulsions occur, protecting the victim from injuries such as tongue biting. When possible, it is recommended that ice packs be placed under the arms around the neck, at the ankles, or at other locations where blood vessels lie close to the skin. Transport the victim to a medical facility immediately, or if this is impossible, seek rescue immediately. Burns of two different types may occasionally be sustained in a caving situation. One is thermal. In a cave, burns of this type are often associated with carbide lamps or accidental inflammation of carbide that is improperly vented, with flames from backpack stoves, or with hot or boiling liquids being heated for drinks or food. (An incident is recorded in the caving literature in which an individual descending a rope set his own pants on fire with his carbide lamp! He quickly solved his problem by swinging under an adjacent waterfall.) First-aid measures for burns in which the blisters are unbroken include the application of cold water to the site. A clean wet cloth laid over the burn and periodically re-moistened by the addition of water or application of a second, soaked cloth above the first may be helpful. If the burn is open ( broken blisters or deep burns), canteen or boiled water should be used rather than cave water or chemically purified water. A second type of burn that may be incurred is a chemical burn due to leakage from wet cell batteries. First aid measures consist of immediate and continued flooding of the burn with copious amounts of water for at least five minutes and the addition of a neutralizing agent appropriate to the specific electrolyte solution spilled. The essential first aid is to wash away the chemical completely, as quickly as possible, with large quantities of water, using a shower or hose if available . . . Immediate washing is more important than neutralizing the chemical and should be continued for at least five minutes. Remove the victim’s clothing from the areas involved. If an eye or eyes are contaminated the Red Cross recommends continued irrigation of the eye with water for at least five minutes in case of acid contamination, or fifteen minutes in case of alkali contamination. In the case of any serious burn, the victim should, of course, leave the cave immediately and seek medical assistance. For far too long where caves are concerned, man has lived by the adage “out of sight, out of mind” and has used caves as dumps and sewers, both intentionally and inadvertently. Everything from dead animals to human sewage has been dumped, diverted, or allowed to sink into caves. Intentional abuses are not as common as they once were, and as a population we are becoming smarter about what may eventually happen underground to sewage that is dumped aboveground or channelled into waterways. As our p0pulation increases, however, so does our waste, and increasingly there are threats to the underground world, caves included. 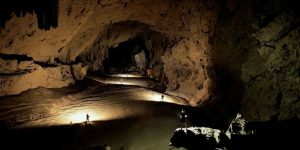 Also, caves are being visited by constantly growing numbers of individuals who may add to varying degrees to the pollution of the cave waters and general cave environment. 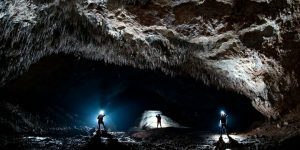 Therefore cavers should realize that potential cave health hazards may include bacteria, parasites, viruses, and other disease-carrying or organisms. Most water in caves today should be considered suspect and a potential transmitter of diarrhoea, hepatitis, typhoid, and other diseases. In some caves one will have a great deal of contact with cave dust, dirt, mud, guano, and similar materials; it is important that cuts and abrasions received in the cave be thoroughly cleaned, cared for, and watched for signs of infection. If the latter occurs, see your doctor. Certainly any puncture wound should be treated immediately by a doctor who will determine whether a tetanus injection or tetanus toxoid booster injection should be given. Cavers are advised to keep recommended immunizations current, particularly tetanus and typhoid.